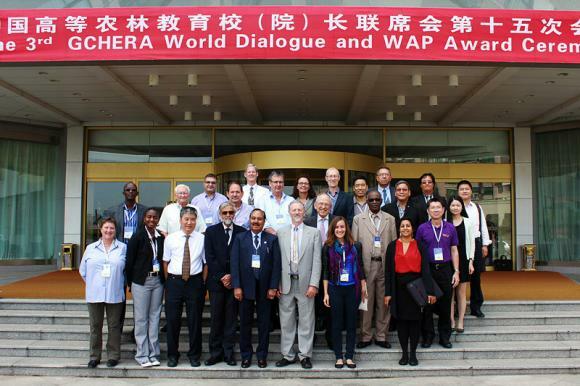 The GCHERA Assembly and World Dialogue, held from 19th to 21st September, in Nanjing, China gave an opportunity to young people to have their say about how universities develop their agricultural and life sciences curricula. YPARD reports on its participation in the conference and the hopes and expectations of young professionals for how GCHERA will keep the dialogue going. How can we shape education so that it matches young people’s needs if we don’t involve them in curricula development discussions? This has been an overly repeated question in conferences but with no concrete answer to it. But The Global Confederation of Higher Education Associations for Agricultural and Life Sciences, fondly referred to as GCHERA is on a mission to change that. GCHERA is a global confederation of associations of universities that discusses and voices, on a global level, the way(s) forward to make and maintain universities’ work relevant. YPARD was invited to take part in GCHERA Assembly and World Dialogue, from 19th -21st September, in Nanjing, China, to not only discuss and concretise plans for building a shared vision with GCHERA, but also to strengthen collaboration between the two parties especially at this time when GCHERA is determining its action plan for the year 2016-2020. As young professionals, we see the added value of GCHERA as a catalyst for stronger benchmarking and research on current educational programs and job market’s needs. This could be in terms of disciplines (notably soft skills) and the ways of teaching – maybe by providing some research and monitoring tool kits for universities. In addition, GCHERA could also be an online platform pillar upon which, sharing of best practices among universities is enhanced. For this to successfully happen, we believe that young people need to be involved in board decisions especially now that GCHERA is charting a way forward. This will help them bring their own perspectives to the table while gaining leadership skills and experience from senior professionals. And this is something Paul Singh the winner of the 3rd GCHERA World Agriculture Prize competition organized by GCHERA and Nanjing University concured with. Engaging young people in GCHERA’s core work will foster inter-generational exchanges and two-way learning among senior and junior professionals. For us this is an important milestone as it’s a first phase for strong collaboration between YPARD and GCHERA in 2016-2020. GCHERA committed to carry on the discussions in order to identify concrete ways to work together. Board members also expressed interest in YPARD work and currently, connections are being made with YPARD national representatives. Perhaps this is what universities should lead young people to: dreaming, thinking and creating. What do you think?